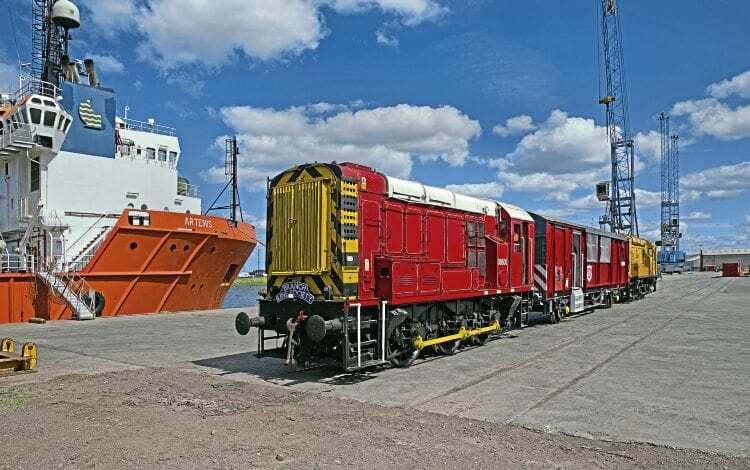 A CHARITY rail event organised by A V Dawson and the Branch Line Society to celebrate the growth of the Teesside freight terminal raised thousands for local charities. More than 200 people joined a Class 08-hauled tour of A V Dawson’s 100-acre site in Middlesbrough on June 25, taking advantage of the rare opportunity to visit the comprehensive facilities. Two one-hour return trips were operated around the terminal with Nos. 08600 and 08598 covering different lines, including the Automotive Steel Terminal, Teesside Riverside Intermodal Park (TRIP), and Middlesbrough Goods Yard. The tour was also extended onto A V Dawson’s quayside site, the first time this section of track has carried passengers since it opened in 1830. The sold-out event raised £6,800 for local charities, plus another £400 for a local Brownies group, which provided cakes and refreshments at the event. Charlie Nettle, A V Dawson’s head of marketing and business development, said: “This was an amazing event which has raised a huge amount for local good causes. It was incredible to see rail enthusiasts coming from far and wide to visit the sidings, rail loops and shunts at our site. Kev Adlam, fixtures secretary of the Branch Line Society, added: “The interesting route, rare track and unusual traction made this a really outstanding and memorable day.